Shine Bright Like A Diamond! IJOY Diamond 234 Kit Coming! If we use the famous singer Rihanna's song to describe this item, do you think it is ok? 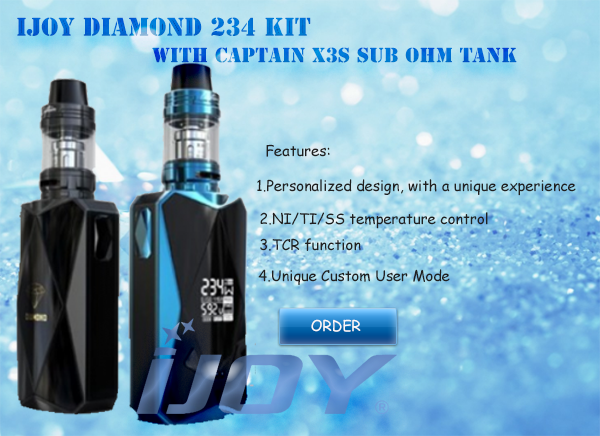 As from my part, Diamondis good for the new ijoy kit from name but not from shape. Please check more follow me! IJOY Diamond 234 Kit is support 20700 battery, firing speed is super fast and you can hardly feel any delay. Its output is fierce and operation is simple. It features a super large OLED screen and has nice hand feel. The USB cable in the package can be used for charging and upgrading the firmware. When powered by by dual 20700 batteries, its battery capacity reaches 6000mah with 40A output current. Please remember to login and use coupon code: 253DAM to get big discount!